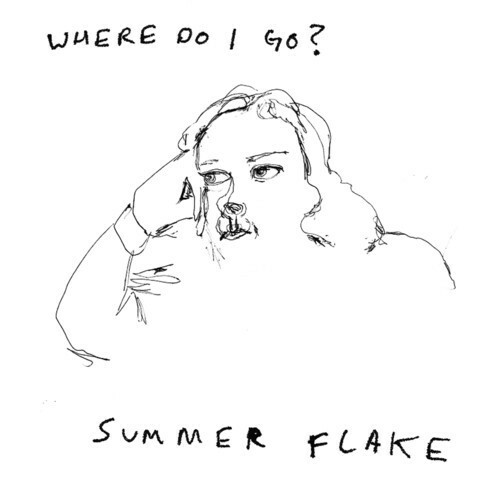 An exercise in divine despondence, Summer Flake’s Where Do I Go? is one for the brokenhearted. A cracked portrait of a daydream written and recorded by veteran musician, Steph Crase, it’s the second solo EP of introspective melodies from the ex-Batrider, Birth Glow and No Through Road performer. As a core player in what you could loosely call an Adelaide ‘sound’ – listless and disheveled guitar music from the city’s slacker community of the past decade – her EP comes across accordingly. A sense of place is unmistakable, not least because Batrider’s Sarah Chadwick contributes the artwork and No Through Road’s Matt Banham lends vocals to ‘Race Car’, a song credited to Birth Glow. In fact, Crase’s very pseudonym, Summer Flake, is a moniker used along with Ellen Carey’s ‘Raven Blue Winter’ and Nick Carey’s ‘Dried up Leaf’ during the dusty hallucinations of the aforementioned band. What exactly a Summer Flake is, is anyone’s guess and also beyond the point. Because whether it stands for doomed snow, an absentminded sunbather or, more likely, a meaningless combination of words, there’s certainly a funny, nonsensical quality to Crase’s lyrical and melodic stream of consciousness, however downbeat and self-deprecating. Presumably, the recording process has evolved from last year’s self-titled EP -assembled piece by piece and cobbled together on cracked software -even if the magic still happened at home. But then, it feels as if the very essence of Summer Flake comes from a comfort zone given to inducing the kind of ennui that late nights alone at home only can. It’s a record that meanders along a flowing, searching guitar line, culminating in an almost wordless final track ‘Through the Window’, with its evocative echoes of dreamy first light. Presenting a cosy contemplation no doubt specific to a physical and emotional isolation and boredom, Where Do I Go? is a languorous trundle along distant vocals and instrumental echo. Even before hearing the undulating rhythms of songs, like ‘Talked Me Round’ and ‘Known All Along’, there’s a sense of someone coming to terms with regret and being dealt a dud hand, which can only be remedied by a sense of self, reflected in the persistent mantra of “I will never give up” in ‘Racecar’. That’s because Crase is sincere, not as some kind of reaction to the vapid contempt of modern culture but because, musically at least, she always has been. And for that Where Do I Go? is a welcome escape into the wistful romance of music as it should be; a clarity of mind that leaves behind a residue, not so much of hopeless gloom but of a mute melancholy that found peace in a song.